It’s a breezy, sunny day off the shore of Victoria, BC, and a group of about 20 — ranging from children to the elderly — circle the deck of a boat. Our hands grip the railing or clutch cameras. Our eyes are locked on the blue Strait of Juan de Fuca, ignoring the silhouettes of the Cascade Range in the distance. We’ve come in hopes of catching a glimpse of the region’s famous orcas, including the remaining 74 endangered Southern Residents. These whales face threats on many fronts, including starvation, pollution, and disease. Among them is J35, or Tahlequah, who carried her dead newborn for an astonishing 17 days in a show of mourning. We’re on a tour led by Orca Spirit, one of many whale-watching companies based in Victoria. I picked them because of their reputation for responsible whale-watching practices, and commitment to eco-friendly initiatives like carbon-neutral boat trips and and using sustainable products. Most of the people I talk to on the boat didn’t choose them for these reasons, instead citing good reviews, timing, and cost. Many of my fellow whale-watchers seem unaware that choosing responsible guides is essential if they want the whales they’re here for to survive. Every year, thousands of tourists flock to watch whales in the Salish Sea — the body of water bounded by the Olympic Peninsula, Vancouver Island, and the coasts surrounding Seattle and Vancouver. Whale-watching can be an incredible education and conservation tool, as well as deliver unforgettable experiences. As an obsessive whale-lover since toddlerhood, I’ve gone on several expeditions, and they’ve provided some of the most exciting and magical moments of my life. But, especially in the Salish Sea, whale-watching can cause problems for the whales themselves. Boat traffic and noise are among the threats to the Southern Residents. Tankers, ferries, shipping, fishing, recreational, whale-watching, and other boats, even kayaks, crowd the waters and disturb the orcas if they get too close. Boat noise can impact whales’ echolocation — which they use to feed — explains Christianne Wilhelmson, executive director of the BC-based Georgia Strait Alliance (GSA). A Washington State task force recently suggested a three-to-five-year moratorium on all whale-watching boats viewing the Southern Residents. The most pressing issue facing the Southern Resident orcas is starvation. Many experts agree that the most pressing issue facing the Southern Residents is starvation. The Transient orcas, which share waters with the Residents — though they don’t socialize with each other — are thriving in the area, despite the noise. The Transients and Southern Residents are different subspecies. The Southern Residents are a unique ecotype that has developed distinct characteristics based on their environment, one of which is diet. While the Transients eat seals, which are plentiful, the Southern Residents eat Chinook salmon, which are increasingly rare. The salmon’s numbers have fallen dramatically in recent years, primarily due to environmental degradation, according to the Washington State-based Center for Whale Research. Boat noise makes that problem worse by adding another hunting challenge. A noisy whale-watching boat that hurts the orcas’ chances of feeding can turn a harmless-seeming activity dangerous. Jeff Friedman, co-owner and captain of Maya’s Legacy Whale Watching in Friday Harbor, WA, knows that vessel noise and traffic can have severe consequences for whales. But he believes whale-watching boats don’t have to contribute to the problem. Maya’s Legacy — like Orca Spirit and almost all other licensed whale-watching companies in the Salish Sea — belongs to the Pacific Whale Watch Association (PWWA), of which Friedman is US President. The PWWA is a voluntary ecotourism association that works with conservation and research groups, and has developed strict guidelines to make whale-watching as safe as possible for whales. We want guests to see the whales for who they are, and that’s easier if we’re a predictable fly on the wall. Though there are American and Canadian government regulations requiring that boats keep a minimum of 200 meters from whales, experts agree that’s not enough to keep whales safe. And though groups like the GSA regularly advocate for more regulations, progress is slow (the 200-meter guideline was only passed in Canada in June, tightening looser guidelines). In addition to maintaining a 200-meter distance (unless the whales approach the boats; fleeing rapidly could disturb them further), PWWA guidelines include not cutting off a whale’s path, travelling no faster than the whale if parallel to it, and not watching whales for more than 30 minutes with other boats present, or 60 minutes if they’re not. Slow speeds are especially important, according to Friedman. Boats shouldn’t go more than 7 knots within a 1-kilometer distance of the whales, because research has found speed is the largest factor in creating noise underwater. The boat slows and quiets. The wind stills. Everyone stands. 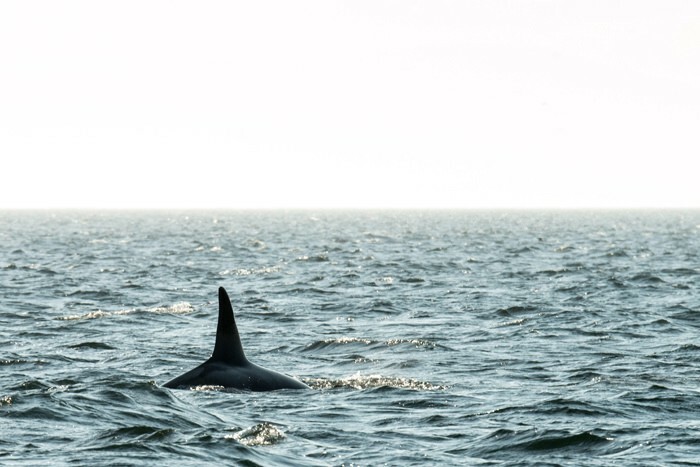 Taylor Chapdelaine, a photographer with Orca Spirit, announces that a small group of Transients have been spotted. A male’s 1.5-meter pointed black dorsal fin slices through the water and juts into the blue sky. Females’ shorter fins appear, then plunge below again. For a brief second, we see an egg of white: the rarely sighted eye patch. It hints at the real size and life force of these creatures. The passengers hush. Chapdelaine continues to provide information about the whales and our boat’s actions. She explains why we can’t get closer: the regulations and the likely chance that the boat will distract the whales from feeding and other normal behaviors. Chapdelaine mentioned this earlier as we left port, the wind whipping our faces. But she says it again and again. Later, she tells me it helps manage guests’ expectations. Some have seen captive orcas or swum with dolphins, and expect more intimate whale encounters. They can become frustrated seeing recreational boats stop just a few meters from the whales. Whale-watching boats, stopped a safe distance away, can signal whales’ presence to other boat owners. After a few minutes, we’re surprised to see three whales break the distance boundary and swim a few dozen meters toward us. A small one dives and surfaces on the other side of our boat, and my fellow passengers pivot to catch a glimpse before it dives again. The surprise helps us recognize that the whales’ behavior isn’t about us. They’re not on our schedule; they don’t necessarily appear where we wish. They are thinking, communicating beings, separate from us — and all the more majestic for it. Experiencing that reality, up close and personal, helps visitors learn to care about the fate of these animals, says Orca Spirit’s Merrett. That evening at dinner, orcas still swimming through my vision, I mention to a server that I’m in the area to whale-watch. She tells me she prefers going out on friends’ boats, because they can get so much closer to the whales. People like my server don’t necessarily need their expectations of whale-watching lowered, just reframed. They need to move from a human-centered approach to an animal-centered one. That strikes me as not only important for ethical wildlife viewing, but for planet conservation. Reframing expectations is important, and not only because it makes for a pleasant trip. The GSA’s Wilhelmson worries that guests’ frustrations — with maintaining distance, or leaving when there are too many other boats around — could cause some operators to ignore voluntary guidelines and disturb the whales. Guests also need to encourage responsible viewing by advocating for it, expecting it, and learning to see the beauty in watching whales from 200 meters away. Guests need to encourage responsible viewing by advocating for it, expecting it, and learning to see the beauty in watching whales from 200 meters away. Advocating for responsible viewing requires finding a whale-watching company (or any wildlife-viewing company) that does everything in their power to lead ethical trips. Friedman and Merrett encourage prospective whale-watchers to find groups that follow the guidelines set out by the PWWA, whether they’re in the Salish Sea or not. Many other regions lack whale-watching associations, so it’s important to check out their websites and call for information, Friedman says. “Ask them what their idea of ethical whale-watching is,” he advises. “Listen to not just the answers but the language.” Responsible whale-watching companies should discuss distance, speed, predictable behavior, and time regulations enthusiastically, not as annoyances or bendable rules. Their approach to whale-watching should be about education rather than pure entertainment; they should aim to see the whales exhibiting natural behavior, rather than interacting with the boats. On the water, they should regularly talk to other boats, and pick whale-watching spots that aren’t crowded. They should be involved with conservation efforts and make regular donations. They should work with whale researchers. Whale watching companies can buy carbon offsets and use eco-friendly products help reduce pollution that hurts whales. Smaller vessels produce less noise. It’s another gorgeous day on the Salish Sea, and I’m sailing with Maya’s Legacy. We’ve bounced across the water from Friday Harbor to Lime Kiln State Park. And here, several hundred meters offshore, I finally see them: six of the remaining Southern Residents. They’re from J Pod, one of the three small Resident pods that remain. Their dorsal fins are rounded. The white or gray area behind the dorsal fin, called a saddle patch, has spots of black in it. They are some of the world’s greatest fishers, with knowledge of salmon runs humans can only dream of. They have deep, meaningful family relationships. Children live with their mothers all their lives. Their mothers teach them everything, and the young seem to never disobey. As I think about losing not just an ecotype but an entire culture, an otherworldly sound fills the air. Friedman has turned on the hydrophone. The squeaks, the buzzes, the echoing chirps are orcas communicating in a language unlike any other whale’s, in a dialect unique to J Pod. Perhaps they’re discussing food, or the weather, or family drama. Perhaps they’re telling jokes. Perhaps they’re saying things humans can’t conceive of. The echoing chirps are orcas communicating in a language unlike any other whale’s. Perhaps they’re discussing food, or the weather, or family drama. I’ve heard recordings of whales before, but it’s astounding to hear these sounds live, coming from creatures I can see with my own eyes. Suddenly, I understand in a way I never have before how little we see on the surface, and the intricacy of these lives underwater. I understand, though I’m on a small boat stopped far from the whales. By letting the whales do their thing, by giving them space and predictability, by trying to understand their behavior rather than simply gawking at their size, an ethical approach to whale-watching has provided an experience just as magical as seeing them up close. Humans share the seas with these amazing creatures, and I believe it’s natural we would want to spend time in their presence. But we have to do it without causing harm. We can hardly claim to love the whales, otherwise. Jessie Szalay’s writing ranges from creative nonfiction to business journalism. 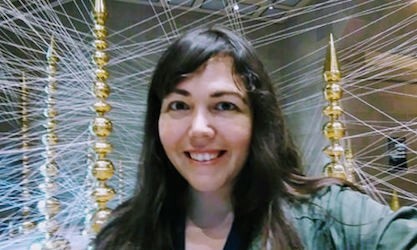 She writes, edits, and teaches in a prison education program in Salt Lake City, Utah, where she lives with her husband, bullmastiff, and two geckos.